This Addo Park guest farm and its famous neighbour, Addo Elephant National Park, make a great combination for superb malaria-free safaris and tours in Settler Country. In a beautiful, malaria-free mountain setting, this Eastern Cape guest farm near Addo Park offers a drop of luxury in Big Seven safari territory. Learn about the humble dung beetle and other fascinating African animals whilst exploring this part of South Africa. Addo Dung Beetle Guest Farm is situated next to the Addo Elephant National Park and 80km (50 miles) from Port Elizabeth. Steeped in history, the Sundays River Valley is the setting of this Addo Park guest farm. Clans have come and gone over the centuries with more settlers arriving here in the last 300 years. The valley back then was a popular hunting area and indigenous animals such as the Elephant, eventually became endangered. Addo Elephant National Park was established in 1931 with the last remaining 11 Elephant. Just 4km (2.5 miles) from the main gate is Addo Dung Beetle Guest Farm, which is built around one of the historic waterholes used by the Elephant in the past. 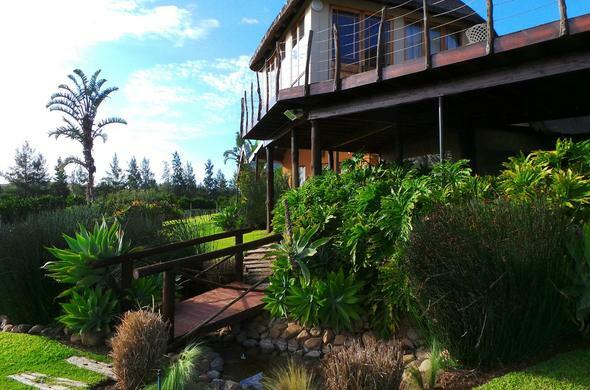 The Guest Farm has magnificent views of the Zuurberg Mountains in this South African area. Addo Dung Beetle Guest Farm is located on a working citrus farm in the Eastern Cape. It is dedicated to the conservation of another endangered creature, the Addo Flightless Dung Beetle - unique to this area. All creatures great and small can be appreciated here while enjoying the accommodation, great food and interesting tours. This farm near Addo Park has a safari area which is being re-stocked with indigenous animals such as Eland, Zebra and Kudu.